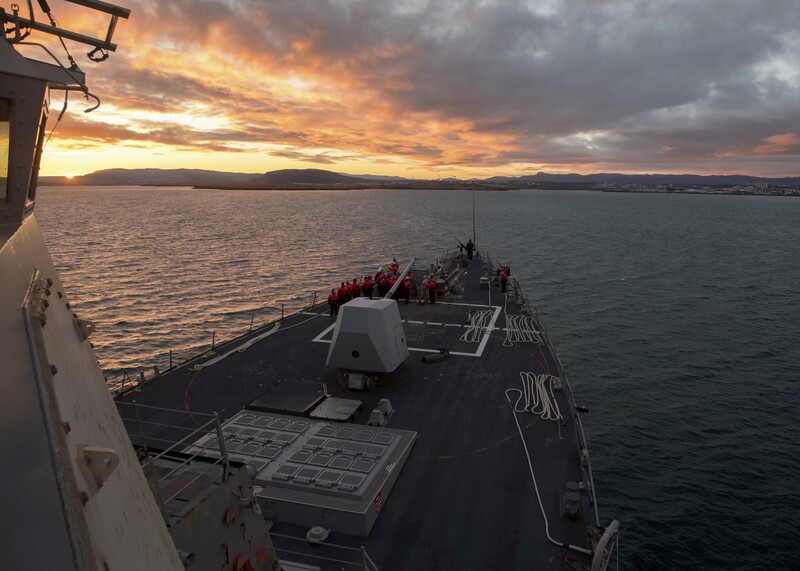 REYKJAVIK, ICELAND – The head of naval forces in Europe is satisfied with the increased presence he’s seen in his theater this year, but he stressed that the U.S. will also have to rely on its allies and partners to counter a growing threat. 2018 brought a noticeable uptick in naval presence in Europe, after Adm. James Foggo and other leaders have sounded the alarm about Russia’s increased submarine activity and aggression towards its neighbors. This spring, Foggo, who commands U.S. naval forces in Europe and Africa, had carrier USS Harry S. Truman (CVN-75) and most of the strike group’s escorts, as well as two of the three ships in the Iwo Jima Amphibious Ready Group, in his theater during their regularly scheduled deployments. Now the Truman CSG is back in Europe now after a short visit to its Virginia homeport, and the entire Iwo Jima ARG has returned to Europe for NATO exercise Trident Juncture. As the Navy has pushed its Dynamic Force Employment (DFE) concept – that the fleet should be strategically predictable but tactically unpredictable – the shakeup in deployment patterns has so far solely benefitted U.S. 6th Fleet at the expense of U.S. 5th Fleet in the Middle East. Foggo told USNI News on Oct. 16 that the bump in U.S. naval presence has allowed him to work with more partners and increase the level of sophistication of those interactions and training events. For example, Trident Juncture was not originally planned to have a carrier strike group participate. The live exercise is largely an amphibious and logistics exercise: surging troops into Norway and sustaining them ashore as they fight to protect Norway from a border invasion. But with the addition of Truman, Foggo said the exercise can now include the element of a carrier strike group providing top cover for Marines heading ashore, as well as provide sea control and anti-submarine warfare to protect the entire coalition activity. “Having the carrier gives us tremendous flexibility: it gives us an air wing which is very robust, capable of protecting itself, capable of refueling itself, and operating with the other NATO air assets in the North Atlantic theater,” Foggo said. “We’re not done yet – when Trident Juncture is over, we’re going to send [Truman] someplace else,” Foggo said, adding later that Truman was expected to remain in Europe for the rest of the deployment. Of course the Harry S. Truman Carrier Strike Group will go home at some point, likely by the end of the calendar year, and the Iwo Jima ARG is expected to return home after the exercise, having completed a full six-month deployment in the first half of this year. Foggo did not say what he expected from the next CSG and ARG deployments from the East Coast, but he did note the many other assets he had permanently in 6th Fleet. “I’m pretty comfortable now with having a robust command ship that is state of the art – so USS Mount Whitney (LCC-20) is equivalent to Blue Ridge (LCC-19); wasn’t always that way, she was overhauled – and having the four destroyers forward-deployed in Rota, Spain, who are doing not just the integrated air defense mission and [ballistic missile defense] mission, but they’re also doing everything that a Burke-class destroyer can do in terms of anti-air warfare, maritime domain awareness and anti-submarine warfare. So at this point in time I don’t see a need to ask for anything else, I think we’re doing pretty well,” Foggo said when asked by USNI News what else he needs in his increasingly important corner of the globe. “The other thing that we have that other alliances or other potential adversaries don’t have is we have friends,” he continued. Later that day, speaking at a Vardberg Association event at the Nordic House in Reykjavik, Foggo said that 22 of the 28 other countries in NATO have navies of various sizes and with various capabilities. “Some are very large, like the Royal Navy, like the French Navy, like the Spanish Navy, Norwegian Navy. And so we’re working together in this combined arms game, particularly in undersea warfare, and that is where I believe there is a significant threat,” he said. But, he added, some like the Baltic navies are smaller but have expertise in niche capabilities like mine countermeasures. “One of the things that I’ve encouraged them to do is to continue to put capital investment into manned systems and unmanned systems to maintain that competitive edge in mine countermeasures, mine warfare, because it takes a little while for other nations to come into the fight and to bring the kit that would be necessary to do mine sweeping operations to restore access” if an adversary were to mine any chokepoints in Europe. Foggo said other niche capabilities in European militaries would be vital to support early stages of a conflict, if one were to break out. One such capability, also informed by his previous experiences, is refueling aircraft. During Odyssey Dawn, he said, NATO only had six tankers in theater to support early strikes in Libya. The United States brought 140 more in within a couple of weeks, but the six were insufficient ahead of the U.S. being able to flow its forces into place. Foggo said he hoped the ongoing Trident Juncture exercise would identify those kinds of capabilities that NATO is short on, to help inform plans for future exercises and operations.